A brand new residential building at 245 East 115th Street in Manhattan’s East Harlem neighborhood is currently accepting applications for four middle-income one-bedroom apartments. 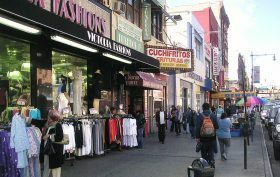 The eight-story building sits just one block from 116th Street, the business hub of Spanish Harlem that features lots of restaurants and shops. Qualifying New Yorkers earning 130 percent of the area median income can apply for the one-bedroom apartments for $2,270/month.